Recognizing the importance of protecting California’s commercial citrus industry and backyard citrus trees, Governor Jerry Brown’s 2018-19 California state budget includes $12.5 million from the general fund dedicated to fighting an incurable citrus disease called Huanglongbing (HLB). Signed last week, the funds will be used by the Citrus Pest & Disease Prevention Program (CPDPP), a program primarily funded by California citrus growers and administered by the California Department of Food and Agriculture. The CPDPP helps detect and eradicate Huanglongbing in residential areas, suppress Asian citrus psyllid populations, control the movement of the Asian citrus psyllid, enforce regulations, and fund outreach programs to homeowners, industry members and local governments. While Governor Brown’s commitment to helping fight HLB is a step in the right direction, California citrus is at a crossroads. More than 685 cases of Huanglongbing have been detected in California, with more than 350 detections in 2018 alone, all in urban areas of Los Angeles, Orange and Riverside counties. The hope is that they find HLB and stop it there. Nelsen said that the chances of a grower introducing the insect into an area is rather slim; it’s more often likely that the disease will be introduced to a grove. Testing is random and more lab space is needed. President-Elect Trump May Help Make California Agriculture Great Again! The election of Donald J. Trump as the 45th President of the United States may prove very significant for California. He and his future administration may be able to make sense of the devastating water deliveries diverted from California farms to protect fish species that may already have become extinct, in order to comply with the Endangered Species Act. Joel Nelsen, president, California Citrus Mutual and a leader in California agriculture, is encouraged by the election results. “You know, the Donald Trump election was a bit of a surprise to me. You can always hope, but the numbers did not look that good. Now that he is our president-elect, I think we can be somewhat optimistic about the next Congress and this next administration,” Nelsen said. Joel Nelsen, president, California Citrus Mutual. Nelsen said the optimism is going to be on several fronts. “One, I think we have an opportunity now to move water legislation that contains real storage and creates water for a bigger population in California,” he said. “We also have an opportunity to slow down a rogue agency—which I would call Environmental Protection Agency (EPA)—and their activity specific to crop protection tools. We can get an effort going to modernize the Endangered Species Act. Nobody wants to eliminate species, but let’s face it, when that was first signed and passed, it was two generations ago. I think we need to take another look at that,” he said. Nelsen noted there are some opportunities on the horizon. 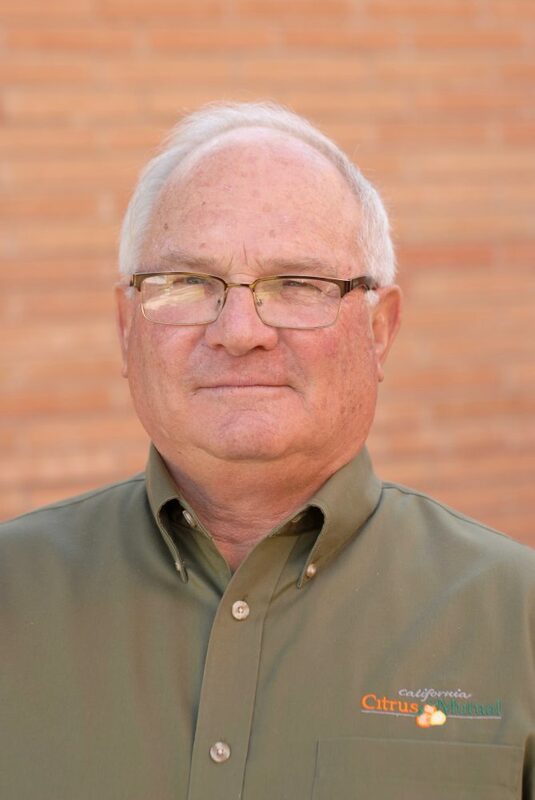 He hopes the upcoming Congress and new presidential administration will generate some positive activity for the California agriculture industry . “We must have a mindset that others will attempt to do what they think cannot be done. It will be up to many of us in leadership positions to ensure that there’s still a balanced approach with this administration before the next one comes in,” Nelsen said. Quarantines are now in place in both Merced and Monterey Counties due to recent Asian citrus psyllid (ACP) detections. One ACP was detected near the City of Merced in Merced County and two ACP in one trap within the City of Salinas in Monterey County. E Yosemite Avenue. Monterey County’s quarantine measures 111 square miles and is bordered on the north by Pesante Road; on the south by the Salinas River; on the west by Castroville Road; and on the east by Gabilan Creek. The quarantine maps for both Merced and Monterey Counties are available online at: www.cdfa.ca.gov/go/acp-maps. Please check this link for future quarantine expansions in these counties, should they occur. Quarantines in new counties will be announced separately. The quarantine prohibits the movement of citrus and curry leaf tree nursery stock, including all plant parts except fruit, out of the quarantine area and requires that all citrus fruit be cleaned of leaves and stems prior to moving out of the quarantine area. An exception may be made for nursery stock and budwood grown in USDA-approved structures which are designed to keep ACP and other insects out. Residents with backyard citrus trees in the quarantine area are asked not to transport or send citrus fruit or leaves, potted citrus trees, or curry leaves from the quarantine area. ACP county-wide quarantines are now in place in Imperial, Los Angeles, Orange, Riverside, San Bernardino, San Diego, Santa Barbara, Tulare and Ventura Counties, with portions of Alameda, Fresno, Kern, Kings, Madera, Merced, Monterey, San Benito, San Francisco, San Joaquin, San Luis Obispo, San Mateo, Santa Clara, and Stanislaus counties also under quarantine. The ACP is an invasive species of grave concern because it can carry the disease huanglongbing (HLB), also known as citrus greening. All citrus and closely related species, such as curry leaf trees, are susceptible hosts for both the insect and disease. There is no cure for HLB and once a tree becomes infected, the diseased tree will decline in health and produce bitter, misshaped fruit until it dies. In California, HLB has only been detected on residential properties in Los Angeles County. This plant disease does not affect human health. Residents in the area who think they may have seen ACP or symptoms of HLB on their trees are urged to call CDFA’s Pest Hotline at 1-800-491-1899 or your local agricultural commissioner’s office (Merced County (209) 385-7431; Monterey County (831) 759-7325). For more information on the ACP and HLB, please visit: www.cdfa.ca.gov/go/acp. Joel Nelsen, the president of the Exeter-based California Citrus Mutual noted that most homeowners do not realize how intensive it is for authorities to monitor traps for the Asian Citrus psyllid (ACP) at their homes. “Later, he comes back to the home and again, knocks on the door and finds that the homeowner is home. He says, ‘Can I put a trap out here to find out if you’ve got the Asian citrus psyllid?’ The homeowner hopefully says, ‘Yes.’ He comes back in two weeks. He looks at the trap. There’s no ACP. He comes back two weeks later, and if the homeowner is home, he looks at the trap,” Nelsen explained. “Hopefully the homeowner says, ‘Yes,’” said Nelsen. Nelsen noted that the inspector visited five times already within a two month period, and now he needs to do inspect elsewhere, so having that homeowner be amenable to that much intrusiveness is a significant goal. Nelsen noted, “The consumer education program that forms the partnership between us and them, from our perspective, is vitally important so the consumers understand what Huanglongbing (HLB)—the fatal citrus disease carried by ACP—is”. Agriculture Secretary Tom Vilsack announced $30 million in funding TODAY for 22 projects to help citrus producers combat Huanglongbing (HLB), also known as citrus greening, a devastating citrus disease that threatens U.S. citrus production. The money will fund promising projects that could offer near-term solutions as well as research funding that may develop long-terms solutions. The promising near-term tools and solutions are funded through the HLB Multiagency Coordination Group while the research projects are funded through the Specialty Crop Research Initiative Citrus Disease Research and Education (CDRE) program, which is made available through the Agricultural Act of 2014 (Farm Bill). Two projects to provide improved delivery of thermotherapy to HLB infected trees, a promising treatment that has shown to help infected trees regain productivity after treatment. One of these projects will test thermotherapy on a grove-wide scale. since studies have shown heating a tree to 120 degrees for approximately 48 hours can kill the HLB bacterium in the upper part of the tree, allowing the tree to regain productivity. This funding will address the challenge of identifying a quick and practical way for growers to use the technology on a large scale. Six projects to provide citrus producers with best management practices in Florida citrus groves. One project will focus on lowering the pH of the irrigation water and soil to strengthen the root systems of citrus trees to help them better tolerate HLB infection. Three projects will support different combinations of integrated management approaches for sustaining production in trees in different stages of infection. Two projects will test strategies for preventing tree death due to HLB infection. One of those will field test rootstocks that have shown ability to tolerate HLB infection. The other will use technologies to rapidly propagate the tolerant material for field use by the industry. Three projects to increase early detection of HLB. One project will train dogs to detect HLB infected trees. Detector dogs have proven to be highly adept at detecting citrus canker and early results suggest they will be an effective early detection tool for HLB. One project will develop a root sampling and testing strategy. One project will compare several promising early detection tests. Four projects to provide tools to kill the Asian citrus psyllid (ACP), the vector of HLB. One will produce and release the insect Diaphorencyrtus aligarhensis as a second biological control agent in California. One project will use a biocontrol fungus to kill ACP adults. One project will use a trap to attract and kill ACP adults. One project will increase the use of field cages for the production of the insect Tamarixia radiata in residential areas, especially those that are adjacent to commercial groves in Texas. Tamarixia has already proven to be an effective biological control agent for ACP. Using field cages will enable the wider use of this effective ACP control. 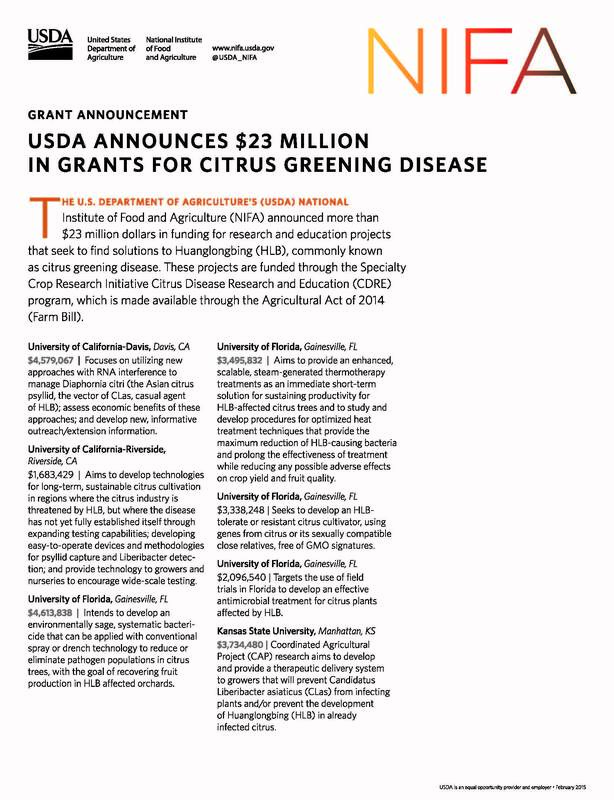 In addition to these projects, USDA’s National Institute of Food and Agriculture funded more than $23 million dollars for research and education project to find lasting solutions to citrus greening disease. Examples of funded projects include developing HLB-resistant citrus cultivars, the development of field detection system for HLB, using heat as a treatment for prolonging productivity in infected citrus trees, creating a new antimicrobial treatment, among others. A fact sheet with a complete list of awardees and project descriptions is available on the USDA website. Fiscal year 2014 grants have been awarded to two California universities, University of California, Davis, $4.6M and University of California, Riverside, $1.7M. The University of Florida, Gainesville and Kansas State University, Manhattan, are also receiving research awards. CDRE is a supplement to the Specialty Crop Research Initiative (SCRI). The focus of this year’s funding was specifically on citrus greening disease. Because there are wide differences in the occurrence and progression of HLB among the states, there were regional as well as national priorities for CDRE. 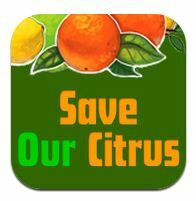 These priorities, recommended by the Citrus Disease Subcommittee, fall within four categories: 1) priorities that deal with the pathogen; 2) those that deal with the insect vector; 3) those that deal with citrus orchard production systems; and 4) those that deal with non-agricultural citrus tree owners. One subcommittee member is Justin D. Brown, Vice President and General Manager, D Bar J Orchards, Inc. in Orange Grove, California. SACRAMENTO, January 7, 2015 – A portion of Madera County has been placed under Asian citrus psyllid quarantine for the following the detection of one ACP northeast of the City of Madera, in the Madera Lake area. The quarantine zone measures 100-square miles, bordered on the north by Road 603; on the south by Avenue 15; on the west by Road 26; and on the east by the Madera Canal. A link to the quarantine map may be found here: www.cdfa.ca.gov/plant/go/acp-qmaps. The quarantine prohibits the movement of citrus and curry tree nursery stock out of the quarantine area and requires that all citrus fruit be cleaned of leaves and stems prior to moving out of the quarantine area. An exception may be made for nursery stock and budwood grown in USDA-approved structures that are designed to keep ACP and other insects out. Residents with backyard citrus trees in the quarantine area are asked not to transport citrus fruit or leaves, potted citrus trees, or curry leaves from the quarantine area. ACP county-wide quarantines are now in place in Imperial, Los Angeles, Orange, Riverside, San Bernardino, San Diego, Santa Barbara, Tulare, and Ventura counties, with portions of Madera, Fresno, Kern, San Joaquin, San Luis Obispo, and Santa Clara counties also under quarantine. The ACP is an invasive species of grave concern because it can carry the disease huanglongbing (HLB), also known as citrus greening. All citrus and closely related species, such as curry trees, are susceptible hosts for both the insect and disease. There is no cure once a tree becomes infected, the diseased tree will decline in health and produce bitter, misshaped fruit until it dies. HLB has been detected just once in California – in 2012 on a single residential property in Hacienda Heights, Los Angeles County. This plant disease does not affect human health. Residents in the area who think they may have seen ACP or symptoms of HLB on their citrus trees are urged to call CDFA’s Pest Hotline at 1-800-491-1899. For more information on the ACP and HLB, please visit: www.cdfa.ca.gov/go/acp .